Home DIY Projects	Benjamin Moore Tapestry Beige Paint for the Win! Happy Monday, friends! Today is a glorious day! Why, you ask? I finished painting our guest suite this weekend! And I am LOVING the Benjamin Moore Tapestry beige paint I chose! Come see how it turned out! I had the most difficult time choosing a paint color for the guest room and bathroom. The trim is a taupey, off-white color and the adjoining bathroom has brown tile. Since redoing the entire bathroom is not in the budget (thanks to LOAFI-(aka living on a fixed income) I need to work around it. And, I want the guest room, bathroom and kitchenette to look cohesive and have a more feminine feel in order to off-set all of the dark wood and tile. That’s a BIG challenge! And this is where I am today! Yes, it’s still a total wreck, but the painting portion is complete! There was quite a bit of trimming and in some cases, it was a tight squeeze between the tall ladder and furniture everywhere. Thus, it was slow going. And then today. I love the lighter color already! I bought a new light fixture to go over the vanity from Ballard Designs, so I’m waiting on either my husband or my electrician to install it. I think it will brighten up the space as well as give it a more feminine vibe. 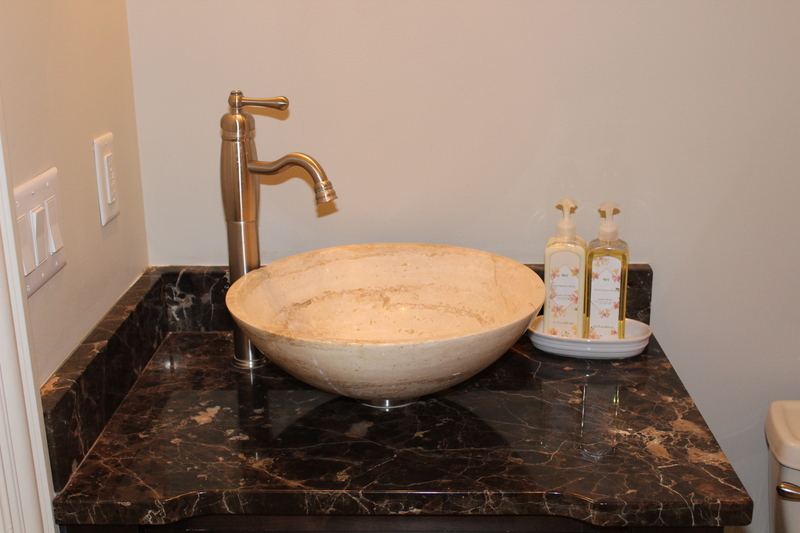 I can’t switch out the vanity or sink, so I’m trying to glam it up a bit with some fancier fixtures. Fingers crossed! I bought a new monogrammed shower curtain from Ballard Designs. Because of the tall ceilings in the bathroom, I had to special order an 84″ length shower curtain and liner. (I ordered the liner from Amazon) I didn’t realize that standard size shower curtains are typically 72″ square, so if you are in the market for an extra-tall shower curtain or liner, be sure to check your measurements before you order! Especially if you plan on having it monogrammed. This shower curtain color is oatmeal with a dark brown monogram. Normally I would order white, but with all of the brown tile, I didn’t think it would look right. I also replaced the curved shower curtain rod with a straight one so it doesn’t take up as much visual space. Next up is upholstering this king-size headboard. Because there is no tufting or tricky angles I feel like I can do it myself. I have some white linen fabric in my stash so I’m going to use that. And because nothing can ever be this simple, I need to put a liner in between the existing fabric and the new fabric so the pattern doesn’t show through. Sigh. Double the work, but it will be well worth the effort. And I won’t have to pay an upholsterer which leaves me with enough money for a new bed skirt from Soft Surroundings and maybe a few accent pillows? Win-win! So, a quick before and after pictures for your viewing pleasure! I love the much lighter color! The room already feels larger to me. The ceiling fan was replaced with a pretty, affordable chandelier. The yellow/gold bathroom went away. The Tapestry beige looks lighter and brighter with the dark wood in the bathroom, too. Plus, there is something satisfying and clean about a fresh coat of paint, don’t you think? Then, the new paint, shower curtain and rod on the right. Clean, simple and classic! You have great taste Dell! I love all the little touches you have added. The venetian mirror and light fixtures you have used are beautiful. What is your advice on things that have not worked well for you in your past remodels? We are going to build a smaller house. We have had mostly fixer uppers before. There are so many choices to make it is mind-boggling plus everything is so expensive!